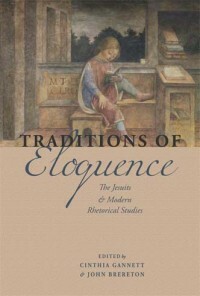 Traditions of Eloquence: The Jesuits & Modern Rhetorical Studies is now available through Fordham University Press. Cinthia Gannett and John Brereton edit what the publisher describes as a “groundbreaking collection explores the important ways Jesuits have employed rhetoric, the ancient art of persuasion and the current art of communications, from the sixteenth century to the present.” The volume considers: the Historical Sites and Scenes of Jesuit Rhetorical Practice, Scholarship, and Pedagogy; Post-Suppression Jesuit Rhetorical Education in the United States; and Jesuit Rhetoric and Ignatian Pedagogy. And Krista Ratcliffe (Reflection: Echoes of Jesuit Principles in Rhetorical Theories, Pedagogies, and Praxes); and Joseph Janangelo (Afterword: Technology, Diversity, and the Impression of Mission). Update: The Journal of Jesuit Studies has reviewed Traditions of Eloquence (Volume 3, Issue 4).